This year’s Hamburg Prize for Theoretical Physics, endowed with 100 000 euros, is awarded to the Japanese scientist Hirosi Ooguri. Ooguri, born in 1962, is a professor at California Institute of Technology (Caltech) in Pasadena (USA). He is one of the world’s leading experts on so-called topological string theory, which addresses mathematical aspects of superstring theory – an important path towards an all-encompassing theory on the nature of our universe. In his research, Ooguri has succeeded in enabling many physical phenomena to be computed with the aid of string theory. He was able to overcome many of the major mathematical difficulties of string theory. Moreover, Ooguri’s research on the quantum mechanics of black holes continues the research of physicist Stephen Hawking, who died earlier this year. For the first time, the Hamburg Prize for Theoretical Physics is endowed with prize money in the amount of 100 000 euros. It is awarded by the Joachim Herz Stiftung in partnership with the Wolfgang Pauli Centre (WPC) of the University of Hamburg, DESY, and the Hamburg Centre for Ultrafast Imaging at the University of Hamburg. It is one of the most valuable science prizes in Germany. “The Joachim Herz Stiftung is delighted that awarding the prize to Ooguri honors not only an outstanding theoretical physicist, but a brilliant teacher as well. Ooguri’s contributions have enabled significant advances to be made in superstring theory research in recent years,” says Dr. Henneke Lütgerath, Chairman of the Executive Board of the Joachim Herz Stiftung. The scientists at the Wolfgang Pauli Centre have great expectations of Ooguri’s research residency. “We are very much looking forward to discussing our research work with Ooguri in person. We are hoping for stimuli which will be mutually very beneficial for our research in string and quantum field theory,” says Professor Volker Schomerus, chair of the jury tasked with awarding the prize, a leading scientist at DESY and spokesperson of the Wolfgang Pauli Centre. The institute, which was founded in 2013, bundles the research activities in theoretical physics and conducts research on issues relating to particle physics, cosmology, mathematical physics, atom and laser physics and many other topics. Its activities also encompass string theory. Ooguri will be presented with the award on 7 November 2018 at the Hamburg Planetarium. 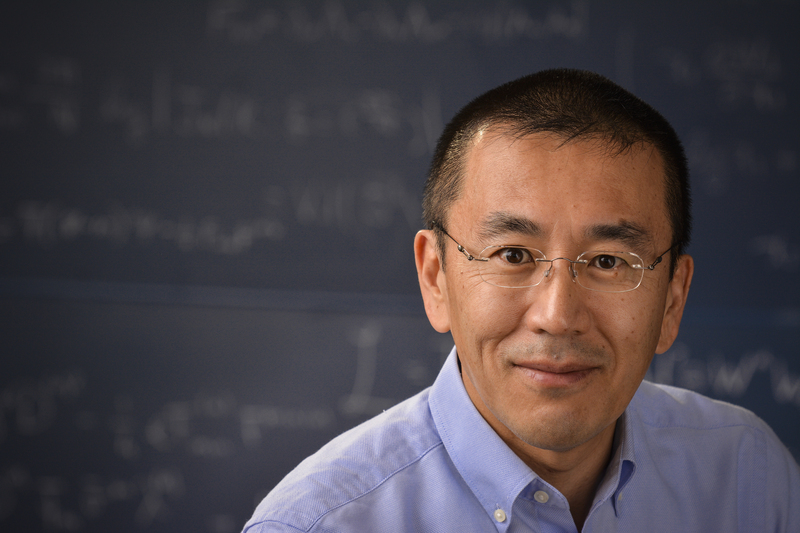 “I am surprised and honored to receive the Hamburg Prize for Theoretical Physics, and look forward to traveling to Hamburg and discussing physics with my colleagues at DESY and the University of Hamburg,” says Ooguri, who will visit Hamburg for research residencies as the recipient of the Prize. Ooguri arrived at Caltech in 2000 as professor for theoretical physics. He is Fred Kavli Professor and Director of the Walter Burke Institute for Theoretical Physics. Moreover, he is a principal investigator of the Kavli Institute for the Physics and Mathematics of the Universe at the University of Tokyo, and has recently been appointed President of the Aspen Center for Physics in Colorado, USA. Since the development of quantum mechanics just over a century ago, physics has built up a good understanding of the nature of the smallest building blocks in the universe and how the cosmos behaves overall. Our world is made up of atoms in which electrons “orbit” a nucleus. This nucleus in turn consists of protons and neutrons. But it doesn’t stop there: the protons and neutrons themselves each consist of three so-called quarks. Elementary particle physics describes how all these building blocks interact with each other. The Standard Model of particle physics is still unable to explain gravitation which has been described very precisely by Albert Einstein’s General Theory of Relativity for nearly one hundred years. However, an all-encompassing theory, a “Theory of Everything” would have to include both physical phenomena. human perception – and all physical measurements to date - discerns only the familiar three spatial dimensions and time. The scientists hope that these constructs will enable physics to be unified into the “Theory of Everything”. Ooguri investigates the mathematical structure of these strings. This structure also allows conclusions to be drawn for many other areas of physics. The mathematical methods advanced by Ooguri can provide a good description of so-called quark-gluon plasmas, for instance. These plasmas are created under extreme conditions in particle accelerators or in extremely energetic processes in space. Moreover, they are extraordinarily relevant to cosmology because according to the conventional theory of the Big Bang, our cosmos consisted of such a quark-gluon plasma during the first few fractions of seconds. Ooguri is also very successful in making his research more publicly available. He is the author of six books in Japanese, which have sold more than 300 000 copies and have been translated into Chinese and Korean. His “Introduction to Superstring Theory” was awarded the most important Japanese Prize for science literature. He was a scientific advisor to the 3D dome theater movie “The Man from the 9 Dimensions”, which received the 2016 Best Educational Production Award from the International Planetarium Society.